Peppermint candy canes, eggnog, and Christmas cookies…these are the flavors that conjure up Christmas to me. It has been a revelatory experience to discover that they don’t for the rest of the world! So, for purely cultural research reasons, I have been tasting and testing the sweets that Spanish people wait for all year long to eat at the most wonderful time of the year. 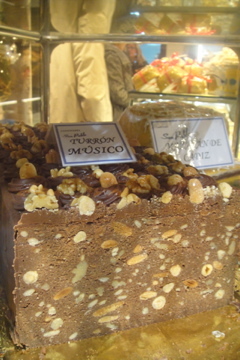 Turrón is unquestionably the king of Christmas sweets here. It has been a part of Spanish Christmas celebrations since the 16th century! 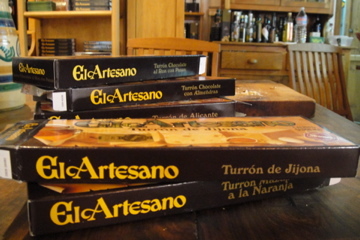 Boxes upon boxes (and in fact, aisles upon aisles) of turrón pop up in the major grocery stores towards the end of November (without Thanksgiving to officially mark the beginning of the Christmas season, Spanish retailers begin stocking for Christmas as early as the beginning of November). 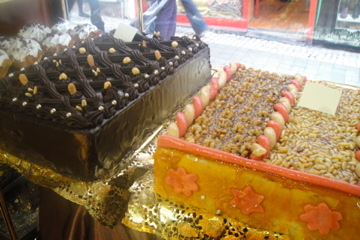 Prettily decorated slabs of turrón in a bakery window. The shop owners slice pieces off the end. We sampled the turrón de jijona y turrón de crema catalana (a toasted custard flavor). The jijona is quite crumbly. The crema catalana has the texture of fudge but with a strong egg yolk flavor. 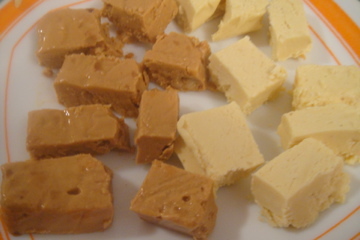 Turrón is quite distinct from our Christmas sweets but I find myself already craving it! PS- In the spirit of Christmas, I’ve enabled WordPress’ Let it Snow feature, so if you notice some falling white dots on the blog, don’t be alarmed! GREAT PICTURES;; BUT I`M ALWAYS AMAZED EVERY TIME YOU SEND A NEW ARTICLE ;; GUESS GOD GETS MOST OF THE CREDIT FOR YOUR GOD GIVEN TALENTS;; HOWSOEVER WE HAVE TO GIVE SOME CREDIT TO YOUR MOM AND SCHOOLS !!! I so enjoy following you through Spain. The snow was a great touch you clever girl! Can’t wait to see you for Christmas!